Evacuations • 2,300 homes in Saratoga Springs and Eagle Mtn. area. 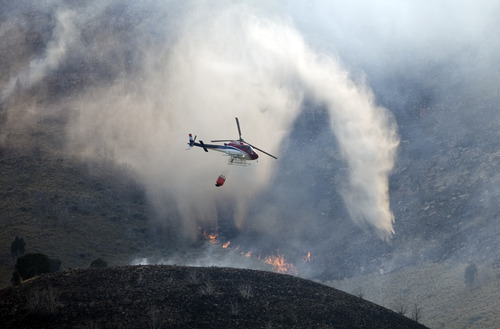 Kim Raff | The Salt Lake Tribune Helicopters are used to try and contain the Dump Wildfire in Saratoga Springs-Eagle Mountain area in Saratoga Springs, Utah on June 22, 2012. 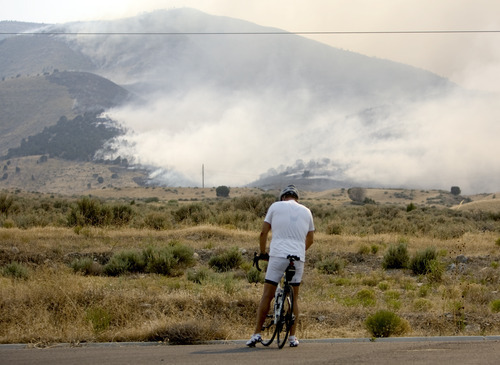 Kim Raff | The Salt Lake Tribune View of Dump Fire in Saratoga Springs-Eagle Mountain area in Saratoga Springs, Utah on June 22, 2012. 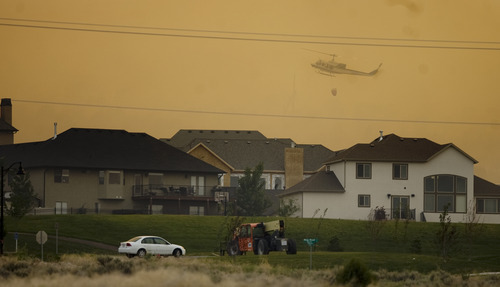 Kim Raff | The Salt Lake Tribune Helicopters are used to try and contain the Dump Fire near subdivisions in Saratoga Springs-Eagle Mountain area in Saratoga Springs, Utah on June 22, 2012. Kim Raff | The Salt Lake Tribune Helicopters are used on the Dump Fire in Saratoga Springs-Eagle Mountain area in Saratoga Springs, Utah on June 22, 2012. Kim Raff | The Salt Lake Tribune Frank Morgan watches the Dump Fire in Saratoga Springs-Eagle Mountain area in Saratoga Springs, Utah on June 22, 2012. Kim Raff | The Salt Lake Tribune Smoke from the Dump Wildfire in Saratoga Springs-Eagle Mountain area in Saratoga Springs, Utah on June 22, 2012. 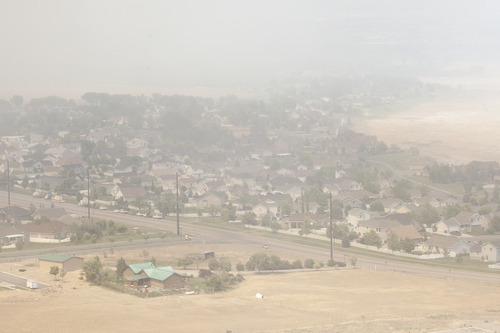 Kim Raff | The Salt Lake Tribune Smoke from the Dump Fire in Saratoga Springs-Eagle Mountain area in Saratoga Springs, Utah on June 22, 2012. 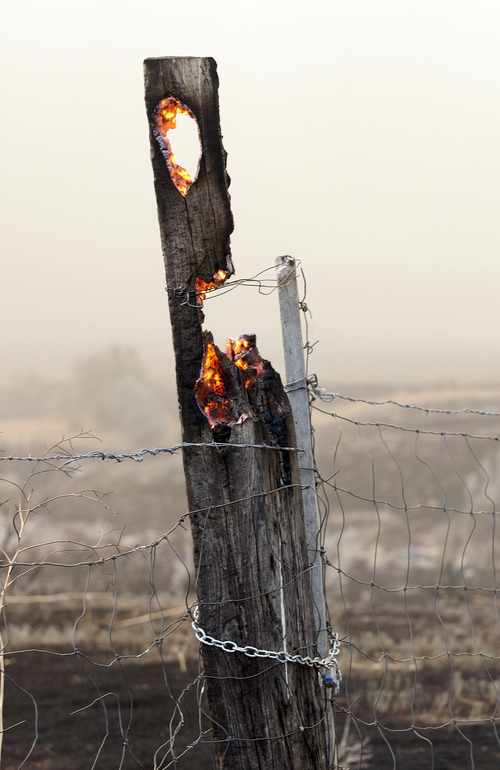 Christopher Reeves | Special to The Salt Lake Tribune A fence post burns near Saratoga Springs on Friday, June 22, 2012. Christopher Reeves | Special to The Salt Lake Tribune Kirk Dewey, of the Cedar City Hot Shots, fights the fire near Saratoga Springs on Friday, June 22, 2012. Christopher Reeves | Special to The Salt Lake Tribune Members of the Cedar City Hot Shots firefighters crew fight the fire near Saratoga Springs on Friday, June 22, 2012. 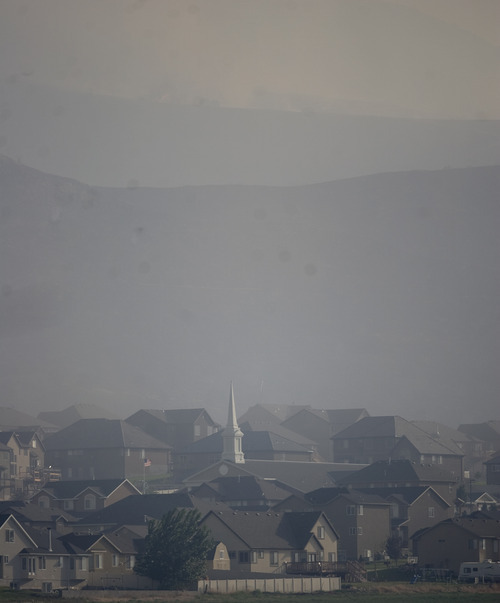 Christopher Reeves | Special to The Salt Lake Tribune Smoke fills the air above Saratoga Springs as a fire burns in the nearby hills on Friday, June 22, 2012. 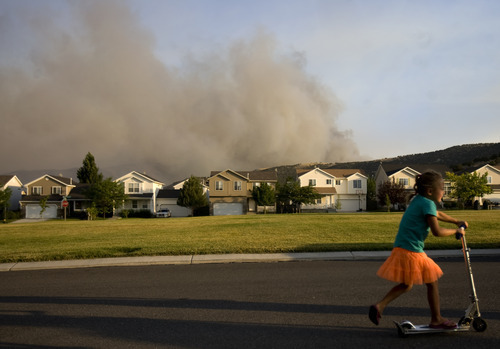 Kim Raff | The Salt Lake Tribune Smoke from the Dump Fire in Saratoga Springs-Eagle Mountain area in Saratoga Springs, Utah on June 22, 2012. Christopher Reeves | Special to The Salt Lake Tribune Fence posts continue to burn in the scorched ground near homes in Saratoga Springs on Friday, June 22, 2012. Christopher Reeves | Special to The Salt Lake Tribune Burned ground shows how close the fire came to homes in Saratoga Springs and Eagle Mountain on Friday, June 22, 2012. Paul Fraughton | The Salt Lake Tribune Lisel Christiansen packs her van Friday, June 22, 2012, as she prepares to leave her home in Eagle Mountain. 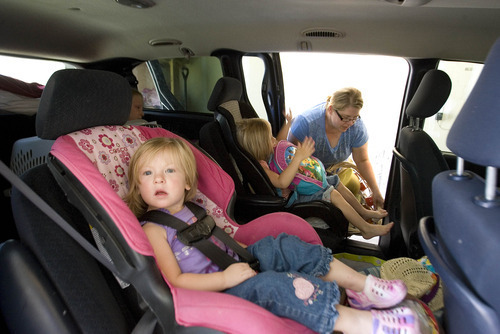 Her children Ellie, age 4, and Luci, 2, front, along with their sister Madelyn, 9, and Lisel's mother, Carol Grimaud, piled into the family van and left the neighborhood that was ordered to evacuate as a wildfire came closer to homes in the area. 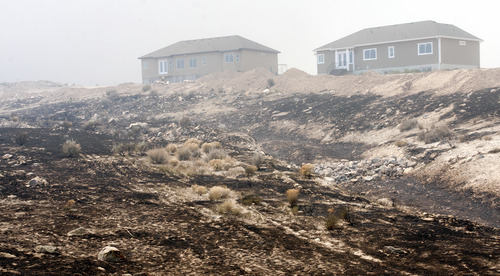 Saratoga Springs • More than 9,000 people were driven from their homes by a wind-whipped wildfire Friday, the 20th fire this year in Utah sparked by target shooting, officials said. The Dump Fire had grown to 4,148 acres by Friday afternoon, said Bureau of Land Management spokeswoman Cami Lee, and officials kept mandatory evacuation orders in place for 2,300 homes overnight. Firefighters had the blaze about 30 percent contained Fright night. 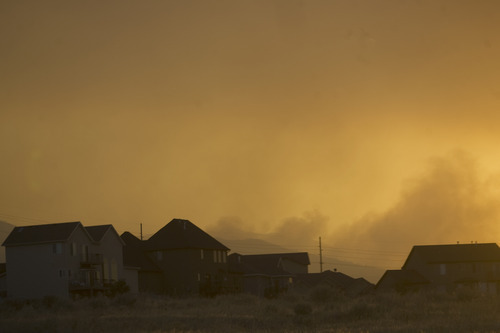 Though no damage or serious injuries had been reported as of Friday night, some homes were a one-half mile or less from the blaze, leaving them vulnerable to a change in the wind or burning debris, said Utah County Sheriff's Office spokesman Spencer Cannon. "I just hope we don't lose any homes," said Interagency Fire Center spokeswoman Teresa Rigby. As crews fought the blaze through the night, 9,200 people in Saratoga Springs and Eagle Mountain stayed away from their homes, the mayors of those towns said. "Its calming down right now," Eagle Mountain Mayor Heather Jackson said. "It's been a waiting game." 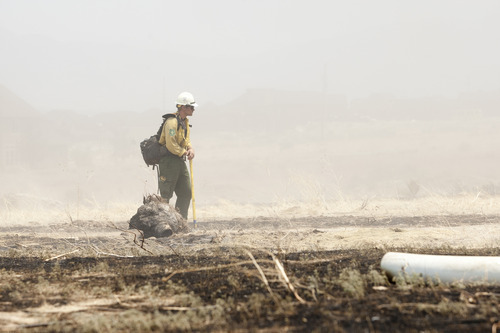 But fire weather meteorologist Shelby Law said the high winds that fed the fire Friday will likely continue through the weekend, along with hot and dry conditions. 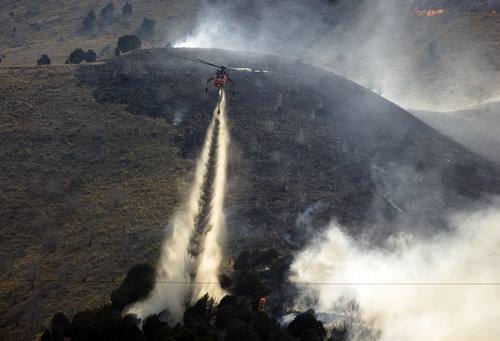 While the winds pushed the fire parallel to populated areas most of the day, by Friday night it was moving directly toward some houses, said Jason Curry of the Utah Division of Forestry, Fire and State Lands. Two shooters sparked the blaze, named for a landfill popular with target shooters, late Thursday afternoon, Curry said. They tried to put it out, then called 911. They won't face charges, Curry said, because they were not breaking any laws. Rising winds, gusting to near-50 mph, whipped the Dump Fire's flames through tinder-dry grasslands on the blaze's eastern perimeter. Firefighters worked in hot, steep territory and also dealt with a flare-up on the west side. Conditions are set for a disastrous fire season to come: A dry winter left a very poor snowpack, and a warm, dry spring has put most of the state in a moderate to severe drought, Law said. "The table is set, as it were, for extreme fire behavior," Law said. "It's going to be a hot and dry summer." Before the lightning season has even begun, typically the busiest time of the year for firefighters, there have already been 400 wildfires in Utah  and 380 have been human-caused, Utah Gov. Gary Herbert said in comments Friday near the fire site. "That's silly. We can do better than that as Utahns," he said, calling on shooters to "self-regulate," since legislation bars sheriff's officials from regulating firearms. A special legislative session may be called to address that, Herbert said. "A lot of the problem we have out here is a lack of common sense," he said, asking local communities to consider banning fireworks during the hot, dry summer ahead. Officials did issue a statewide ban on shooting any ammunition that has a steel component, such a steel jacket, on BLM, state and unincorporated private land. "I think at the end of the day, we'll protect the properties," Herbert said. Two to three hundred firefighters, two hot shot crews, four water-bearing helicopters and 12 engines, as well as a fire-retardant dumping air tanker, fought the fire Friday. 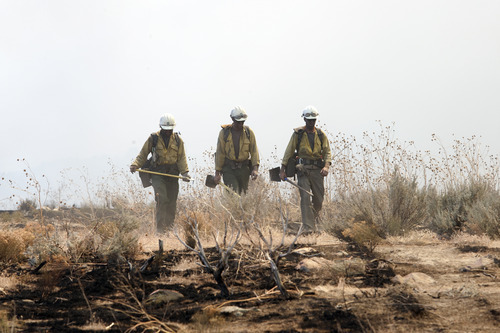 Another 100 firefighters will arrive Saturday morning, along with two heavy air tankers. The crews plan to focus on four electricity transformers in Israel Canyon. If those go down, Utah County Sheriff Jim Tracy said, the whole region could lose power. Lee described the burning terrain as "rocky and steep," and said the heavy smoke and ash was limiting crews' visibility as they attacked the blaze. One firefighter suffered a minor burn Friday. About 170 people were registered Friday to stay at a Red Cross shelter at Westlake High School. The evacuation orders went out about 10 a.m. for the Saratoga Hills, Eagle Top, Kiowa Valley, Stillwater and Jacobs Ranch subdivisions  or roughly all homes south of the Pony Express Parkway, east to Smith Ranch Road and then east to Redwood Road. Authorities were escorting residents to their homes if they needed to retrieve essential medications or documents. Evacuees soon began arriving at the high school with what little they could gather of their belongings  and their pets  on short notice. Livestock reportedly was being sheltered at the rodeo grounds in Eagle Mountain. Most road closures were inside evacuated subdivisions; Redwood Road was reopened Friday afternoon after a closure. Holly Borgeron, an evacuee from the Saratoga Hills subdivision, said she was thankful for the refuge, but said the high school's atmosphere was "nerve-wracking. Kids are crying, moms are crying." A neighbor, Denise Thompson, said she had to leave work at Intermountain Medical Center in Murray to grab her three children and join her husband. Reunited, they planned to stay with other family members in the area. "I think we are safe with our home on the edge [of the mountain], but homes above us are more sketchy from what I hear," Thompson said. "I am more concerned about how neighbors are feeling. A lot are panicking, they need reassurance that everything is OK."
Eduardo Gomez and his family were evacuated from his home in Fox Hollow, a subdivision of Saratoga Springs, but he returned Friday evening to grab important documents like birth certificates, passports and keepsakes like photographs. He said he thought the blaze was contained when he went to work Friday morning, but "when my wife sent me a picture about 10 a.m., I knew I had to come back." Gomez said his five children  all under 10 years old  are frightened by the fire. He said his kids told him "the hills were on fire." Two other Fox Hollow residents, Stephen Stallings and Michael Reed, stayed behind to help other residents shut off the gas and to watch for potential looters. Said Stallings, "We're just here keeping an eye on the neighborhood." Stallings also said he wanted to see things for himself rather than "hear about it second-hand." But he added that he and Reed would flee if things became dangerous. "We're not going down with the house," he said. 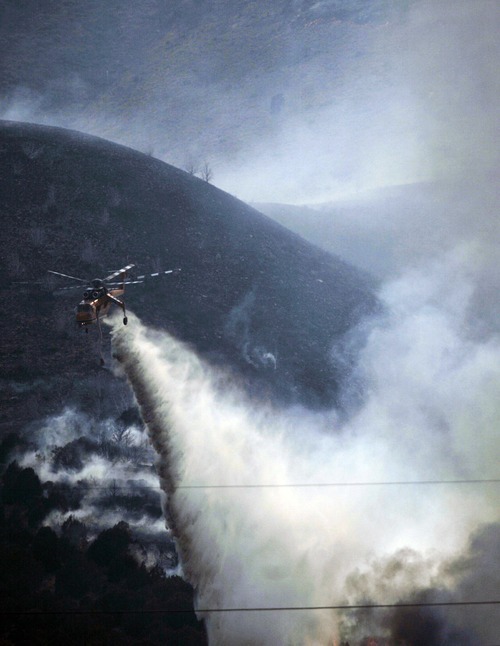 Utah Congressman Jason Chaffetz, who was on the scene Friday, said Saratoga Springs, Eagle Mountain and Utah County had gotten approval for Federal Emergency Management Agency to cover 75 percent of their fire-fighting costs. "I'm just here to help cut through the red tape ... so there's no excuse for lack of communication," Chaffetz said. The weekend could be long, hot and gritty for fire-fighting crews, with temperatures expected to soar past 100 degrees. Winds of 15 to 25 mph were predicted to lash the region, with gusts topping 50 mph. The National Weather Service issued a statewide "Red Flag" extreme wildfire risk warning extending into the weekend. "We can't afford one more spark hitting the ground in Utah," Curry said.